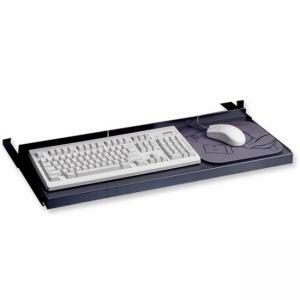 Metal Keyboard Platform is designed to hold a keyboard and allow room for a mouse pad. Nonarticulating platform only moves front to back. Platform does not tilt or swivel. Surface is positioned 3" below bottom of work surface. Minimum clearance for mounting is 32-1/2" wide x 15" deep.